and The University of North Carolina. Project SOAR is funded by USAID and led by the Population Council in partnership with Avenir Health, Elizabeth Glaser Pediatric AIDS Foundation, Johns Hopkins University, Palladium, and The University of North Carolina. It is clear that to achieve UNAIDS’ 90-90-90 goals for controlling the epidemic, whereby 90 percent of people living with HIV (PLHIV)—both women and men—know their status, 90 percent of PLHIV are on antiretroviral therapy (ART), and 90 percent of those on ART achieve viral suppression—HIV programs and services must take into account the gender-specific needs and circumstances of adults and youth. 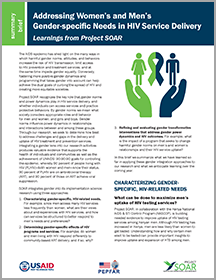 Project SOAR recognizes the key role that gender norms and power dynamics play in HIV service delivery, and whether or not individuals can access services and practice protective behaviors. We are using a variety of approaches to integrate gender into our implementation science research, producing findings that pave the way for effective engagement of women and men, girls and boys in HIV prevention and care, and for more gender-equitable relationships and societies. Project SOAR (Cooperative Agreement AID-OAA-A-14-00060) is made possible by the generous support of the American people through the President’s Emergency Plan for AIDS Relief and the United States Agency for International Development (USAID). The contents of this website are the sole responsibility of Project SOAR and the Population Council and do not necessarily reflect the views of USAID or the United States Government. Through operations research, Project SOAR determines how best to address challenges and gaps that remain in the delivery of HIV and AIDS care and support, treatment, and prevention services. Project SOAR is producing a multifaceted body of high-quality evidence to guide the planning and implementation of HIV and AIDS programs and policies.